For any healthy bbq lamb recipes my suggestion is always to start with a barbecue marinade to add flavour and tenderise the meat at the same time. It’s a lot lighter on the calories than sauce and imparts just as much flavour. This particular marinade is fresh from the Mediterranean Greek islands and as with a lot of Greek food it’s rich in olive oil, lemon juice and oregano. Great flavours and really easy to prepare, just mix up and away we go. To be a defined as a marinade, technically there needs to be an acid in there and it's the citric acid in the lemon juice that does the tenderizing work, the olive oil adds succulence and the oregano.......well need I say more? Note:- The citric acid breaks down the protein in the outer collagen layer of the meat and this makes the meat texture much softer but you need to be careful, marinate in citric acid for for too long and and the acid will have the opposite effect. Protein bonds in the meat (as opposed to the collagen) will start to tighten and the meat will toughen. That's why I suggest 1 hour as the marinade time on this occasion. I've done this dish using diced lamb and made kebabs because the diced lamb has a good surface area for the marinade to work but don't be afraid to try it on chops or steaks, it works great to create countless healthy BBQ lamb recipes. 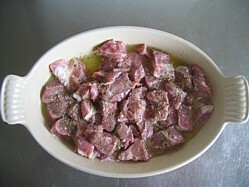 Place the lamb in a marinade bowl and pour over the mix of olive oil, lemon juice and oregano. Marinate for 1 hour turning occasionally and don't bother to refrigerate. Placing this marinade in a refrigerator will tighten up the muscle tissue and because you're only marinading for 1 hour then there's no chance of spoilage. When ready to cook, thread the lamb onto the skewers loosely. Don't pack the meat tightly onto the skewer, leave space between each cube of meat so that the heat can get all round and cook the lamb evenly. I used metal skewers but if you are using bamboo then give them a soak for 30 minutes before using them. Prepare your grill with hot coals and place the skewers on the barbecue and season with salt and pepper and grill for 10 – 12 minutes turning occasionally. When done remove the skewers and place the pitta breads on the grill to warm through. Keep your eye on them because you don't want them to harden and crisp, just warm through and this will take about 2 minutes. When warm take place the pitta in a tea towel in one hand and using a sharp knife in the other, slice into the pitta to create a pocket. You occasionally get a pop of steam from the pitta so using a tea towel will prevent scalding. 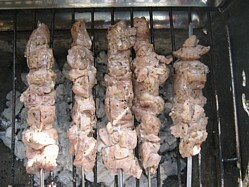 Slide the meat off the skewer into a pitta bread with some salad and a dollop of yogurt or Tzaziki . There really isn’t much more to say other than serve with the lemon wedges and a couple of sprigs of parsley for garnish. Oh, and don’t forget, BBQ lamb recipes like this are best complemented with a glass of red!